What better way to learn about forests, ecosystems, stormwater or the water cycle? EarthCorps can develop field trips that fit your school’s learning objectives and benefit a forest near your school. EarthCorps can customize service projects to meet your students’ and teachers’ learning objectives. Students will take pride in their new knowledge and in the forest that they helped protect. We aim to build long-term partnerships that make a lasting impact on a forest and instill commitment to service. EarthCorps works with students in grades K-12. We can customize restoration tasks and educational activities to the appropriate grade level. In some schools, we work with one grade on three different service projects throughout the year. For other schools, we work with five grades on one big day of service. Each partnership can be tailored to your school’s needs. Please contact our Volunteer Team for more details. EarthCorps works in parks in Seattle and other Puget Sound area cities. 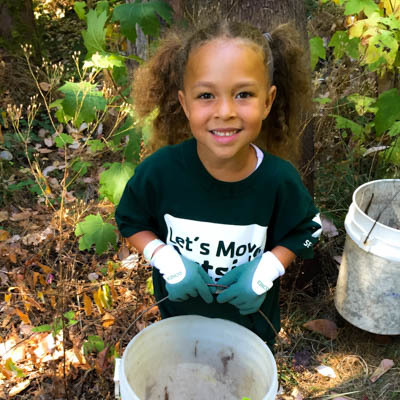 We hope to get students and schools involved in projects that have long-term plans for restoration and stewardship. The Volunteer Team can work with you to find a park that is convenient to your school. Contact the Volunteer Team to get started! Give us a call! Each school partnership is unique.It starts with a conversation. Sometimes we are able to organize a school event with just one month’s notice, other times it takes many months to set up the right event for your students. Looking for an Earth Day event? At EarthCorps, every day is Earth Day! April is our busiest month of the year. Please consider celebrating Earth Day in March or May. We recommend contacting the Volunteer Team by November to set up a spring volunteer event for your school.